Just in time for holiday gift giving, the 2013 Night Paper Owl Calendars have arrived. Night Owl Paper Goods' take on the basic annual calendar is far from just a functional tool. Their calendars are tiny works of art that will keep you in good spirits all year long. Night Owl Paper Goods has released calendars in previous years, but this year they are debuting 7 different styles and designs, and all of them are eco-friendly. From adorable owl shaped calendars to delightful plaid to elegant flower swirls to the cutest set of critters you've ever seen, Night Owl Paper Goods has a calendar to suit everyone's taste. 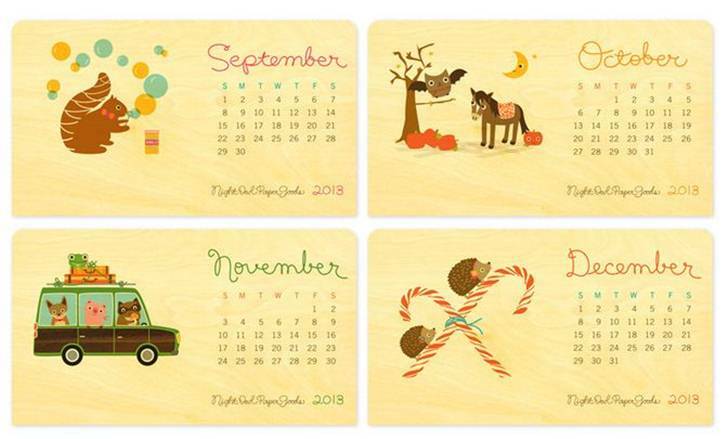 Night Owl Paper Goods’ desk calendars, like the critter calendar shown above come landscape style with 6 flat pages made of sustainably-harvested wood, sliced thin to resemble real calendar pages. The natural wood grain varies from month to month and the entire calendar is 100% biodegradable and recyclable with paper goods at the end of 2013. Their other calendars of the year include yearly calenders, also printed on eco-friendly, sustainably-harvested wood. Last but not least this year is the super cute Country Owl hanging calendar, made of sustainably-harvested wood and 100% cotton cord eyes/hanger. Starting at just $15, and not going above $24, these calendars are eco-friendly gifts you can afford to give for the holidays. 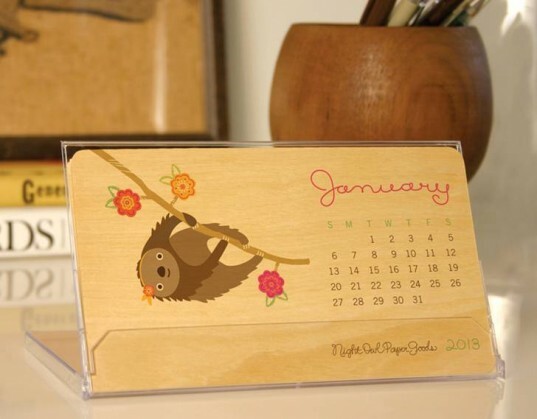 Night Owl Paper Goods' desk calendars, like the critter calendar shown above come landscape style with 6 flat pages made of sustainably-harvested wood, sliced thin to resemble real calendar pages. The natural wood grain varies from month to month and the entire calendar is 100% biodegradable and recyclable with paper goods at the end of 2013. The super cute Country Owl hanging calendar is made of sustainably-harvested wood and features 100% cotton cord eyes/hanger. Starting at just $15, and not going above $24, these calendars are eco-friendly gifts you can afford to give for the holidays. The calendars feature different patterns and colors that will match any decor scheme. Their other calendars of the year include yearly calenders, also printed on eco-friendly, sustainably-harvested wood.